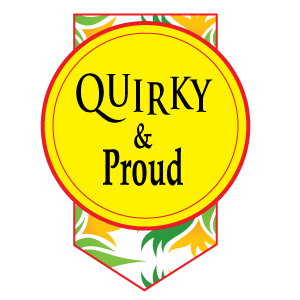 According to the Collins Dictionary, quirky is defined as…. I was talking to a friend at a party recently and in the course of the conversation she referred to me as quirky. She meant it in a nice way and I certainly didn’t take offense, I was probably pleased in a way, but also surprised. Quirky, me? I thought I was the boring sensible one! Now if we had been talking about my husband I would definitely have said quirky was spot on. I have even used the word … affectionately… when talking about my daughter…. She is highly creative, imaginative, musical, individual and, well quirky. But me? I thought I was the boring predictable one! So I decided to ask around, starting first with my quirky husband! His response was to remind me how often he has come home from work to find me (sometimes literally) knee deep in some experiment or other, usually with the kids involved too but all thoughts of time… or a dinner, forgotten. He reminded me of opening the front door to find laughing children darting and running as I bombarded them with giant smoke rings; that there have been jars of “muck” on the windowsill for weeks and that I did in fact serve him green eggs and ham for dinner recently! Okay, I concede, these things might have happened, but does that make me quirky? Next I asked my children, of course they needed a definition first! Once the had the gist of things they all agreed that Dad is definitely quirky (so its not just me that thinks it!) but after a little discussion and consideration they did fell that YES I also fell into the quirky category. They all found it hard to say exactly why but the word “science” popped up a lot in the conversation. Wow, I had no idea – this was becoming quite a revelation! When I asked her why she said it was because of the way I thought, how I looked at life from unusual angles and my creativity, often through science. Finally I asked on line… I wondered how my on line friends would perceive me, having never actually met me “in the flesh”. Looks like I am accidentally on trend for a change… now that is a bigger surprise than the Quirky bit! … am I quirky because I am a scientist or am I a scientist because I am quirky? So, how quirky are you? Go on, be honest! How cool! Giant smoke rings! I’m definitely checking that one out. Sounds like it’s a lot of fun in your house Naomi and it’s definitely good to be Quirky. If being disorganised is one of the criteria I think you could count me in there. I don’t know if it is one of the criteria Una but it definitely fits with me 😉 We are building quite a Quirky club here! No I am not quirky, yet I often think you and I are quite similar, ( the bit of you I know online) and yes I do think you are quirky. tric kearney recently posted…Have you seen my post? No seriously I’ve lost it! Now your question at the end is something that fascinates me – I often wonder if people end up in particular professions because of their personalities or if it’s the other way around. I guess it’s both. Science is quirky and cool so you’re in a good place! Well put Office Mum, I find it a very interesting concept as well.